What a fantastic present! 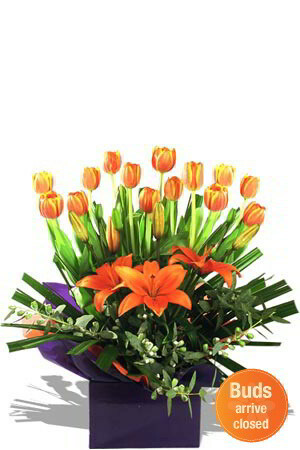 As tulips are only available part of the year, make sure that you get your orders in . 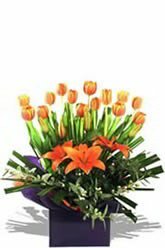 This arrangement is particularly special as you get a great combo of both tulips and Asiatic Lilies.Lilies may be sent closed/partially closed in order to prevent damage and to last longer.Vase not included however; add to the element of surprise by including a Premium Vase to your order. Sure to leave a lasting impression! My friend was very happy with the presentation of the flowers. Thank you. Great experience! Delivery has been prompt, the flowers are fresh. My friend was delighted when she received and showed me a pic of the flowers, they were indeed very pretty! Excellent, my fíancé received the flower in the day i want it and in good conditions and are nice flowers, i like it a lot. Thanks you. Great service but I wish I have received a message letting me know the arrangement was shipped.